That’s One Bigga Meata ball………. That’s 1 beega meata ball………. 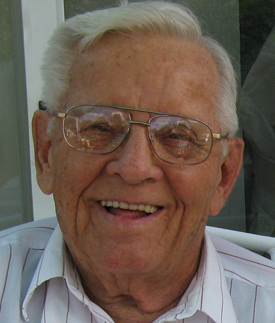 John McCleary, my father, was a great spaghetti and meatball maker and eater. For 62 years, he and Mum coordinated their efforts dozens, maybe hundreds of times to present this delicious meal to our entire family. When Dad was younger, he helped more, but as it became more difficult for him to stand for long periods, he sat in his chair at the head of the kitchen table and peeled garlic and cut up green pepper. Then my mother would put that and the already ground beef through the hand cranked meat grinder. 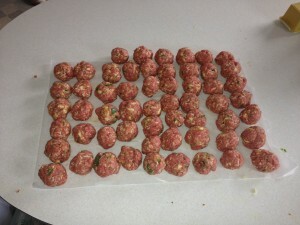 Then Dad would begin rolling meatballs by hand, and lining them up on the table. When we all arrived with our families he could tell us exactly how many meatballs he made that morning and what time he started working on this meal. And, the house would smell amazing….. garlic, tomato sauce, frying beef. Oh my God, that was the most amazing smell, and Dad sat in his place of honor with his bragging rights that he (and Mum of course) had made something we all loved. My oldest son and I loved to have a meatball right out of the frying pan with just a little sauce and a bit of salt. Yummm. I never thought I could recreate that meal for my own family, but a long while back, Dad wrote down what he put in his meatballs and sauce, so I could try. I have tweaked it only slightly…. I use fewer cracker crumbs, and eggs, and more meat in the meat balls, but the sauce is the same. I am always confident that when I put the effort into this meal, that both of my sons will be here with their big appetites. This morning, I put together tomato sauce and meatballs. Dad was on my mind the whole time. Today is a big football day, semi finals for the season. I could care less about that because Downton Abbey is on tonight and that is my thing. But, because it is mostly a ‘man’s’ day, I thought I would make the effort and do it up big with this meal. For almost a whole year, I have been watching my diet and weight. I have done pretty well, but today I will feast. Why? Because I made 57 meatballs (I will announce that to everyone later, like Dad use to in the old days) and the aroma in my house is beautiful. This meatball is for you Dad! 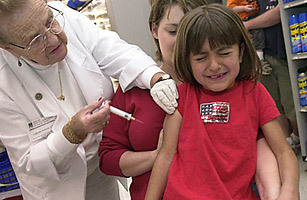 Today, I spent my morning volunteering at a flu shot clinic at the brand new Brewer, Maine Community School. My name is on a list with the State of Maine called Maine Responds. My name landed on that list a few years ago when we had massive flu shot clinics in Bangor because of the Swine Flu scare and epidemic. I love volunteering and doing this work to help preserve public health in my area. The new school in Brewer impressed me. I met and talked with the school nurse, Carol. She offered a tour of their school health clinic. Jeesh, I remember my school nurse’s office and it was the size of a closet. When I substituted for a regular school nurse in a different bedroom community outside of Bangor, same thing….a closet size room with a cot for sick children that needed to lie down. Carols office was so exciting. She had her own space with supplies, records and medications. There was a separate exam room with 2 cots…but what really floored me was the in-school medical clinic with dental services and regular medical services. Two days a week a Family Nurse Practitioner visits from Penobscot Community Health Services up the road. The children are seen by appointment and a sliding scale fee is arranged. In other words, children in need can get care for free. Wow…we have come a long way. This is a community oriented and patient centered way to meet the needs of all children, no matter the financial circumstances at home. I remember small children coming into Walk in Care at Eastern Maine Medical Center, where I worked in the 90s. Too many of them had horrible cavities. Some of their teeth were just stubs and they were infected and in pain. Some of these children had never sat in a dentist’s chair and of course they had not been taught proper flossing and brushing. Diet was another problem. Now, these kids can be cared for and educated about their health AND their teeth right in the school in Brewer. This needs to happen everywhere. No child should be ‘different’ than another when it comes to physical and dental health. I felt so good coming home from my little excursion today. I learned that in places, there is progress in healthcare education and maintenance…..and what better place to start than in our children’s schools?